THE YES MEN FIX THE WORLD is a screwball true story that follows two daring and imaginative political activists - Andy Bichlbaum and Mike Bonanno - as they infiltrate the world of big business and pull off outrageous pranks that highlight how corporate greed is destroying the planet. One day Andy, purporting to be a Dow Chemical spokesperson, gets on the biggest TV news program in the world (BBC World News) and announces that Dow will finally clean up the site of the largest industrial accident in history, the Bhopal catastrophe. The result: as people worldwide celebrate, Dow's stock value loses two billion dollars. People want Dow to do the right thing, but the market decides that it can't. The reality hits Andy and Mike like a ton of bricks: we have created a market system that makes doing the right thing impossible, and the people who appear to be leading are actually following its pathological dictates. At conference after conference, the Yes Men try to wake up their corporate audiences to this frightening prospect, in the process taking on some of the world's biggest corporations. On their journey, the Yes Men delve deep into the question of why we have given the market more power than any other institution to determine our direction as a society. As they appear on the BBC before 300 million viewers, or before 1000 New Orleans contractors alongside Mayor Ray Nagin, the layers of lies are peeled back to reveal the raw heart of truth - a truth that brings with it hope. "This brilliant piece of guerilla humor, rich with political satire, is sure to stimulate discussion and reflection. Through a series of incredibly imaginative hoaxes the Yes Men raise profound questions about the sustainability of capitalism and the ethical responsibility of political humor." "With wit, creativity, and unfailing good cheer, these merry pranksters of the corporate world deliver an upbeat anti-market, anti-corporate message. The 'greed is good' message of Wall Street has met its match in these zealous yet zany activists. They show that humor and ridicule is a powerful weapon again corporate hypocrisy and venality. Seldom has such an edifying lesson in doing the right thing been so much fun to watch." "This is a movie that will get people talking. The plot is madcap comedy about a couple of guys staging hoaxes in order to shake-up prevailing worldviews that have stifled positive social change. Though the vehicle is comedy, the subject matter is very serious: the social responsibility of businesses in unfettered global capitalism. Venues range from Bhopal and Union Carbide to Exxon and the environment to Katrina and New Orleans to Halliburton and catastrophes. The movie challenges the audience to re-examine current assumptions and to do a little utopian dreaming. It is excellent also for initiating classroom discussion - particularly business ethics classes, social philosophy classes, and classes on public policy." "Outrageous! Both the behavior of the Yes Men, and the even more egregious actions of the global corporations they mock. As worth seeing as it is over-the-top." "This film can be used effectively in introductory sociology and social problems courses, as well as in upper level courses on deviance and social control, social inequalities, or any course that deals with contemporary social issues such as environmental sociology, urban of rural sociology, poverty/social class, race/ethnicity, gender, or sexuality...[The film] provides an unorthodox but effective method by which to engage students in a dialogue about the importance of using one's own agency to engage these issues in an attempt to build a better society, both domestically and globally." "Timely...inspiring in its creativity...For those who would point out their shortcomings, there's an implicit challenge of 'what are you doing to fix the world?'." "There is a lot of important material and food for thought here...[The film's] message is clear and well-crafted--whether viewers agree with its politics or not. It is an outstanding film and, thus, highly recommended for students of and collections interested in American studies, bioethics, business, and economics." "The Yes Men's projects are consistently amusing--not just because of their patent absurdity, but also due to people's reactions (often shock, but sometimes offhanded agreement) and the obtuseness of news organizations for not recognizing them as put-ons...Both funny and thought-provoking, this is highly recommended." "Extraordinary...As the 'Yes Men' try to get through to their corporate audience as well as the general public, their ultimate message is an inquiry as to why we have given the market more power than any other institution to drive our society, and how can this incredible power be held in check, much as the three branches of the American Government hold one another in check and balance? Highly recommended." "This wickedly funny documentary lambastes corporate greed...Hope wins out in the end...[and] the absurd economic system that currently rules our world is revealed for all to see; this is political satire at its very best." "I've always appreciated the stunts of the Yes Men, the two tricksters who pose as corporate spokesmen and say things corporate spokesmen never say: things like 'We're sorry,' 'We'll clean up our mess,' and 'It's the right thing to do.' Fans of the duo--and anyone who values jesters who speak truth to power with smiles on their faces--will eat up this inside look at some of their biggest con jobs. The most striking revelation is that these jokesters sweat bullets as they pull off their grandest deceptions." "This is the year's top documentary film." "Educates and entertains; The Yes Men do both. Entertainment that tickles the justice-for-all glands." "Persuasive...You have to admire their ability both to pull off these stunts and to extract such honest expressions of greed from such corporate victims as the businessman who agrees that companies can justify deaths on the path to commercial success. Comic and creepy." "A smart, thoughtful examination not only of the morality of capitalism, but of comedy - the Yes Men fret over the ethics of their prankery with a rigor that their corporate adversaries could learn something from." "Part journalism, part mockumentary...it shines with a raw wit and originality." "This movie is a hoot, and a pertinent one at that...While the subject of corporate greed and malfeasance is depressing, there's something tonic about the impudent laughter this engaging documentary provokes." "More capitalist-critiquing chicanery and fat-cat-fooling fun." "While you might disagree with their politics, it's hard not to appreciate the intricate lengths to which the Yes Men go to deliver their message." "Alternately funny, incisive, and ridiculous...Aims to expose corruption, selfishness, and irrationality in corporate behaviors." "One of the funniest movies I've ever seen, and two of the ballsiest guys I've ever met. Thank God for the Yes Men." "It is exhilarating, sometimes hysterical - unless you are from Dow or Exxon, or indeed Bhopal, where victims were brutalized by a morning of false hope before newspaper exposures restored disenchantment. The film, though brave, gonzo and often funny, raises the bar on the debate provoked by Michael Moore and Sacha Baron Cohen. How cruel does satire have to be - to innocent and guilty alike - to accomplish its missions?" "Yes Men [are] getting no laughs from Exxon, Dow...Exposing corruption and human rights violations among some of the world's most powerful corporations." "Compelling...You've got to be impressed by the creativity and gall of the Yes Men." "Their critics, seemingly hooked by the system which decrees that an unregulated market is the root of all happiness, accuse them of arrogance and cruelty. It would be easier to call them starry-eyed. This is often a very funny film, made more relevant by a recession which began after the film was made." "Sacha Baron Cohen may be the current king of satire...His victims are stooges; peripheral, disposable, helpless. The Yes Men's targets are anything but. Dynamic American duo Andy Bichlbaum and Mike Bonanno pick on people several million times their size, at least in terms of legal, financial and state-sanctioned might...Some of the responses and attitudes the Yes Men encounter throughout their quest have to be seen to be believed. But it's comforting to know that the little guy can cause such a big nuisance. 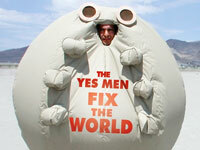 Optimistic and constantly amusing, the Yes Men are a force for the good. That, plus the knowledge that many of those free marketeering goons will have been crushed in the credit crunch, makes this a guilt-edged pleasure." "The film forgoes the unsubtle voice-overs common among films with clear political agendas, mostly allowing the footage and interviews to speak for themselves...the Yes Men leave it to the audience to draw their own conclusions. Mine are that the Yes Men present visions of the world as it might be if ideas and minds weren't chained by 'should' and 'can't' - what real change might look like. The film culminates in this way, with the distribution of 80,000 copies of a fake edition of The New York Times. The cover date is six months into the future, and the spoof paper reports the end of the Iraq war and the switch to a 'sane' economic regime, as well as advertisements from companies promising to dedicate themselves to good causes. Impossible? Perhaps, but you could say the same about two ordinary men walking into the BBC and passing themselves off as representatives of one of the world's biggest companies. 'Can't' is an over-used word." includes scene selection, and SDH captions for the deaf and hard of hearing. "The Yes Men afflict the powerful by exposing the inhumanity at the core of unfettered capitalism so skillfully and hilariously that they--and we--come away inspired to fight another day." "Offers its audience an opportunity to engage in (rather than merely accept or decline) its ideas...The Yes Men encourages discovery and interpretation from its audience...Inspiring." "Their fake capitalists proclaim, 'To hell with what's profitable, let's do what's right!' and watch the markets react with horror...This movie is a glorious testimony to the moral power of satire." "The Yes Men are dissidents of such fearless ingenuity that you want to believe them at face value, but they have already fostered and celebrated a pension for critical thought; the damage is done. The result is a question of selectivity dovetailing with an inspired call to action, but above all, The Yes Men Fix the World is a riotous reminder that patriotism is often misconstrued as troublemaking." "It takes some nerve, not to mention diabolical intelligence and financial recourses, to pull off the elaborate pranks devised by Andy Bichlbaum and Mike Bonanno...They are sowing the seeds of a populist revolt somewhere down the line. If they can do it, why not us?" "Targeting some corporate Goliath, their performance pieces offer a taste of what utopia might feel like if authority told the truth...Delighting sympathetic audiences with the possibility of change." "Biting critiques that call out many a greedy corporate hand." "Given that art only rarely effects social change on such an immediate and grand scale, what better artists to choose as the recipients of the Leonore Annenberg Prize for Art and Social Change? Maybe, given to the right people, that's all it will finally take to truly fix the world." "Watch the movie, feel indignant, then find catharsis. There will be righteous comeuppance. There will be corporate covers blown. There will be justice." "The Yes Men's new documentary consists of sophisticated hoaxes and ridiculous props that will impress anyone regardless of the politics involved." "Bichlbaum and Bonanno have returned with a passionate display of rascally intrepidness, working towards an impossible goal with their sneaky sense of humor and infinite imagination for farcical public displays...The new found energy behind the Yes Men concept makes for persuasive cinema." "This is the rare satire that is entertaining without forgetting to be informative." "Their absurdist, outraged take on Orwellian corporate dogma comes through loud and clear...Genuine satire is a rare and wonderful thing these days, and the Yes Men are genuine satirists. It's great fun to watch them at work." "A foxy-smart takedown of corporate hypocrites." "Both hilarious and inspirational, the film demonstrates just how much two individuals, armed with imagination and courage, can do to change the world." "Bichlbaum and Bonanno engage in entertaining corporate sabotage by weaseling onto the world stage with fake websites, creative hairstyles, and a deep faith in the First Amendment...With this film, they manage to amuse us, and perhaps even motivate us along the way."